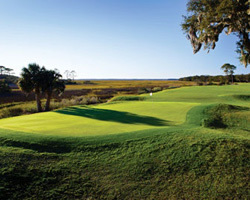 Pete Dye's Genious at The Omni Amelia Island Resort. 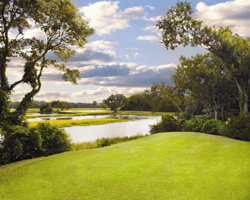 Located on the most northern of Florida’s Atlantic coastal islands, The Omni Amelia Island Plantation Resort boasts two on-site golf courses, one being the highly acclaimed Pete Dye design, Oak Marsh. 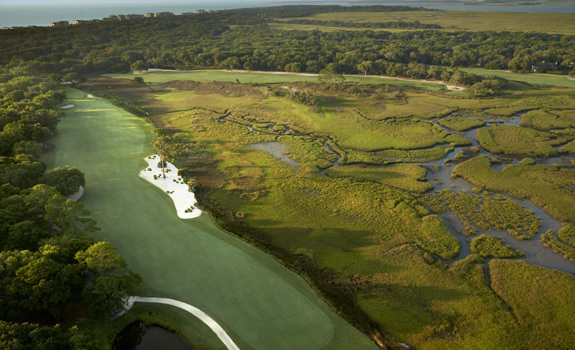 Home to the most current "Big Break," the course is aptly named for the signature trees that line the fairways and the marshlands of the Amelia River that frame five of its most memorable holes. Built shortly after the time Harbortown was completed, it is easy to see similarities in the designs. Encroaching limbs put a premium on controlling your ball flight, while moving the ball left and right off the tee and into the small, heavily contoured greens is sa must here. A true shotmakers routing, Oak Marsh is a wonderful challenge and the marsh holes will be etched in your memory banks for a very long time. Hole 6 is a dogleg right, beast of a Par 4, playing through a chute of trees to a pinched landing area. This most severe green slopes heavily to the water and strip bunker that guards the left side. Reaching the green in regulation is only the first step toward making par. The Par 3 Seventh plays over water to a large sloped green. A long iron or hybrid must be struck purely to avoid hitting it short or left to a watery grave. A deceptive Par 4, Hole 8 crosses a pond twice on the way to the hole. With buttress edges to the fairway and green, little room for errors exists. An overhanging tree also protects access to the green if playing down the right side. Hole 16 is a picture perfect Par 3 that has to be seen and played from the back tees. Entirely over tidal creeks and marsh, this shot will be one you may never forget.